Sometimes I write texts in vim that I later typeset in Scribus. 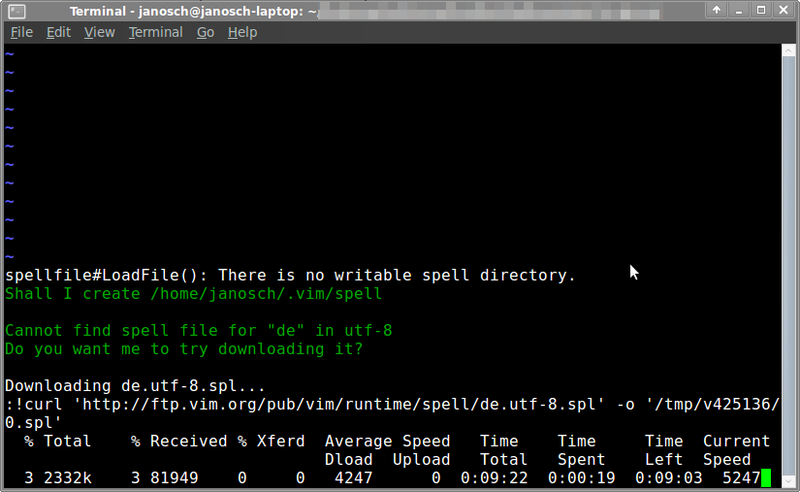 I therefore use spell checking in vim. 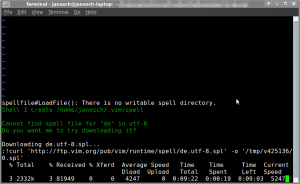 To activate spell checking in German language the following command is used. For other languages change the language code. To enable the spell checking by default insert the appropriate command (without the starting double point) in your ~/.vimrc. I have written an E-Mail to Ubisoft Germany about the copy protection mechanism of Assassin’s Creed II, which needs a connection to the Internet even if you are playing offline. The whole text of the letter can be found on the German version of this page. Special Thank goes to the developers of Linux Kernel, Ubuntu, Gnome, Xfce, Gimp, Gnome-Do, GNU-Cash, KeepassX, TrueCrypt, Scribus, Banshee, VLC Player, Firefox, Thunderbird, Lightning, FileZilla, OpenOffice.org, GParted, Ding, Python, PHP, MySql, Apache, and many more. Right now I can do 100 strokes per minute. And it is even more fun. The only problem I have are the typos I make – They are many. If there is a good method to learn how to avoid them I would be really grateful. Set the active keyboard layout in “System → Settings → Keyboard” to “German → Neo”. Neo is now active but only a beta version in which (compared to the current version) for example “ü” and “ö” are changed. and replace the old files (do not forget to make a backup). In vim the keys “hjkl” are used to navigate. Now these keys are spaced somewhere on the keyboard, so we better use “snrt” to have navigation on the same place as if we were using QWERTY. We exchange the particular letters. I need to use windows at work, so I used to use VirtualBox. Try to install Windows. Everything worked fine until I should insert the license code. It was not possible to insert digits (even after changing the layout on the host back to QWERTY). Since then I use QEMU and Neo is even running with the Windows drivers in my guest system.